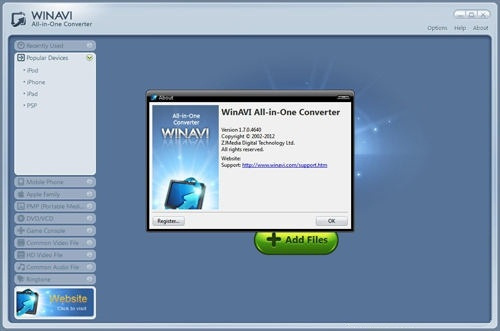 Video Formats supported by All-In-One Converter: WMV, ASF,AVI, RMVB, FLV, RM, MOV, QT, MP4, M4V, DV, 3GP, 3G2, DAT,MPG, MPEG, VOB, FLV, MKV, MTS, M2TS, F4V ; and Audio Formats: AAC, AC3, AIFF, AMR, M4A, MP2, MP3, OGG, RA, AU, WAV, WMA, MKA, FLAC,etc. Output directly to various devices, such as iPad, iPod, Zune, iPhone, Apple TV, PSP, PS3, Blackberry, Xbox 360, Archos, iRiver, Motorola, Creative Zen, MP4/MP3 Player, Smart Phone, Pocket PC, Mobile Phone,etc. Convert video/audio formats files to DVD/VCD/SVCD formats as output and preset DVD menu. Allow output as MKV HD, AVI HD, MP4 HD, MPEG2 HD, WMV HD, RMVB HD, etc. Set the video effects through adjusting the brightness, contrast and screen rotating of video; Crop the video size and set the aspect ratio. Trim or split the favorite part from the video by setting the start position and the end position. High quality and smooth screen with super fast conversion speed, Convert a 4G DVD movie only within ten minutes while a 20 sets TV series only needs one hour.You needn’t wait for a long time. 4G movie only need 10 minutes. It is easy to use for the beginner as well as having advanced functions for the professional user.